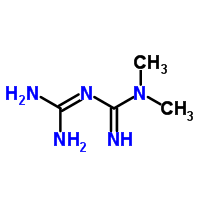 We know that Metformin (see structure), is a biguanide hypoglycemic agent used in the treatment of non-insulin-dependent diabetes mellitus not responding to dietary modification. Metformin improves glycemic control by improving insulin sensitivity and decreasing intestinal absorption of glucose. Metformin's pharmacologic mechanisms of action are different from other classes of oral antihyperglycemic agents. Metformin decreases hepatic glucose production, decreases intestinal absorption of glucose and improves insulin sensitivity by increasing peripheral glucose uptake and utilization. In my earlier blogs, I have covered the recent (findings) updates on metformin. Now researchers lead by Dr. Darrell Wilson (from Division of Pediatric Endocrinology and Diabetes, Stanford University) have found that metformin appears to help overweight teenagers lose weight when combined with a program designed to help them change their lifestyle habits. As per the claim by the authors though metformin hydrochloride is used as a primary or adjunctive treatment in obese nondiabetic adolescents there are limited short-term data to support this therapy and also it is unclear whether any observed effects of metformin on body mass index. Therefore the researchers conducted a 48-week randomized, double-blind, placebo-controlled trial of extended-release (XR) metformin therapy in nondiabetic obese adolescents followed by a 48-week monitoring period after completion of treatment. Researchers found that the addition of metformin to a lifestyle change intervention for a period of 12 months resulted in a significant improvement of BMI regardless of baseline fasting insulin levels, that persisted for 12 to 24 weeks after cessation of drug treatment. The mean (SE) reduction in BMI of –1.1 (0.5) at 1 year was comparable with that observed in other randomized controlled trials of metformin treatment in obese adolescents, although these randomized controlled trials involved shorter treatment duration (about 6 months), targeted obese children with additional diabetes risks, and had smaller sample sizes. The mechanisms of action for these effects have not fully been elucidated but may involve beneficial effects on carbohydrate and lipid metabolism, mediated through adenosine monophosphate kinase.